If you want to avoid the hype Jacuzzi of Art Basel Miami Beach, head north, instead, to Toronto to see Mickalene Thomas’s solo show Femme Noires, which opens this week at Art Gallery of Ontario. (The comparatively decorous local version of Art Basel, Art Toronto, happened last month.) Thanks to a culture of public funding for the arts in Canada, artist-run-centers, university galleries, and big institutions, like the AGO and the Royal Ontario Museum, often have go-to shows befitting a cosmopolitan city, even a rather tidy one like this one. And the local scene is home to a host of small, independent spaces like Franz Kaka, Bunker 2, ma ma, and Main Street. From the inaugural exhibition at the new Museum of Contemporary Art, a group exhibition that brings together a clash of different styles, to the latest edition of a series of public works at a sprawling park (this time around they’re sculptures, but in the past they’ve featured dance and performance art), there’s plenty more to explore in Toronto. Here are six recommendations to check out. 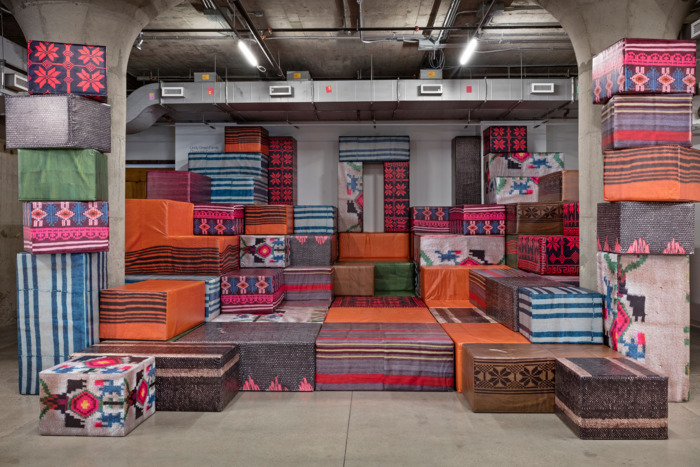 Kandis Williams, the rivers of styxx (2018) at Cooper Cole. Photo: Courtesy of Kandis Williams and Cooper Cole, Toronto. Beth Stuart, “Length, Breadth, Thickness and — Duration” (2018) at the Power Plant. Photo: Toni Hafkenscheid. Courtesy the artist and Susan Hobbs Gallery. On the trail behind Power Plant gallery, on the shore of Lake Ontario, Beth Stuart has re-created a Victorian-era bathing machine, a portable changing room that reminds us of the period’s extreme reverence for modesty. 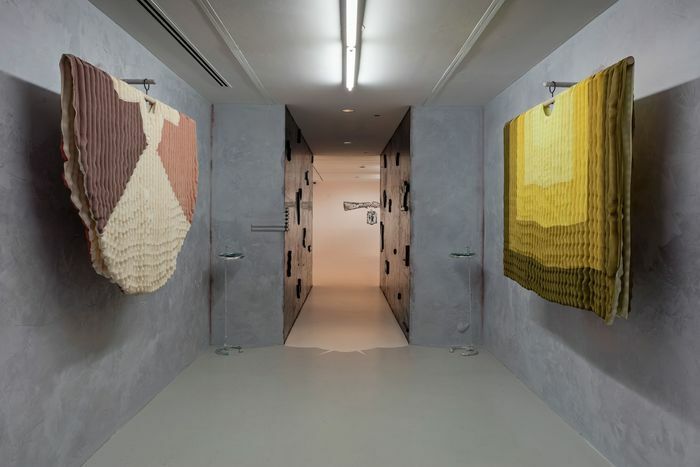 Together with Stuart’s abstract experiments in painting and sculpture inside the gallery, the show aims to investigate the moral code devices like the bathing machine uphold. 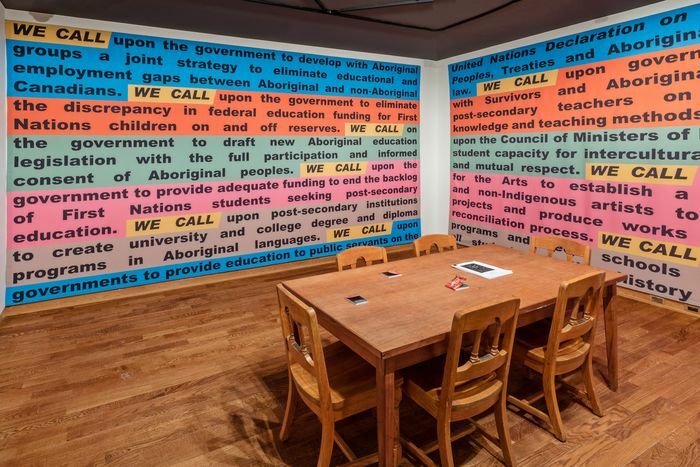 Over at the Art Museum on the University of Toronto campus, cheyanne turions curated a group exhibition guided by Indigenous artist and scholar David Garneau’s concept of “extra-rational aesthetic.” Here, a range of works show artists thinking about self-determination, coloniality, reparations, and the processes of cross-cultural encounters. A standout series of paintings by Joseph Tisiga, the Props for Reconciliation Series, shows characters from the Archie comics in scenes illustrating classic tropes of Indigenous folks. Also included is Mickalene Thomas’s The Origin of the Universe 1, a remake of Gustave Courbet’s The Origin of the World as a self-portrait. 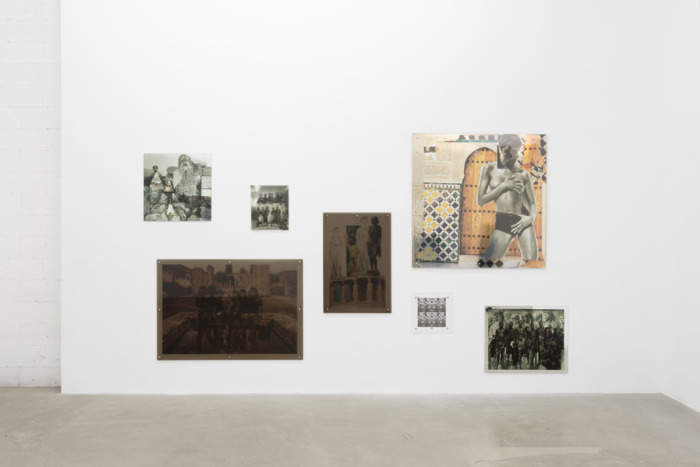 Andreas Angelidakis, DEMOS – A Reconstruction, 2018. Photo: Courtesy of Museum of Contemporary Art Toronto. Photo by Toni Hafkenscheid. 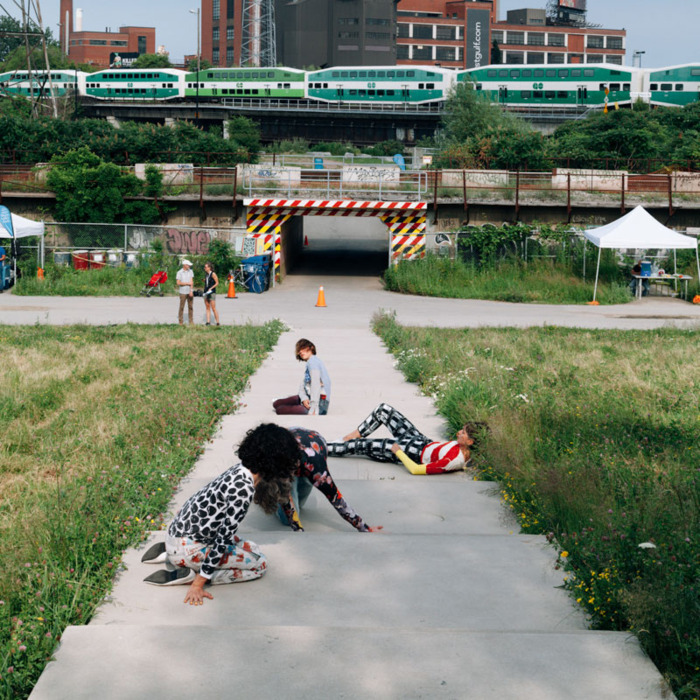 Since 2017, Kari Cwynar has curated temporary public works in the Don River Valley Park, an area of over 200 hectares in the city’s east end. Cwynar’s unusual approach has seen her bring in dancers and performance artists. 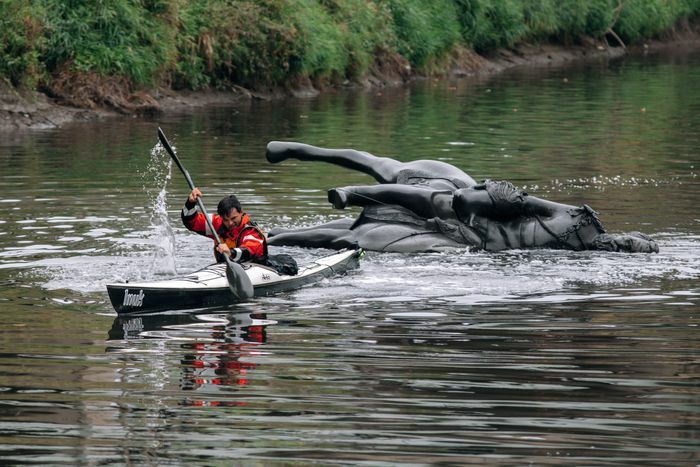 Last fall, some controversy arose when Life of a Craphead (Amy Lam and Jon McCurley) floated a replica of a King Edward VII statue down the Don Valley river as a part of their performance garnering the ire of local white supremacists. For December, a selection of sculptures by Virginia Overton is being installed in the park. Overton, who often works in situ, makes minimal sculptures from scavenged material. These works are adapted from a commission Overton created for the Socrates Sculpture Park in Queens, New York, earlier this year. Here in the Don Valley, she created her sculptures with parts of previous works supplemented by materials she’s sourced in Toronto. One piece, for example, is made of a metal rack she found on Geary Avenue inlaid with marble that she brought from NYC. 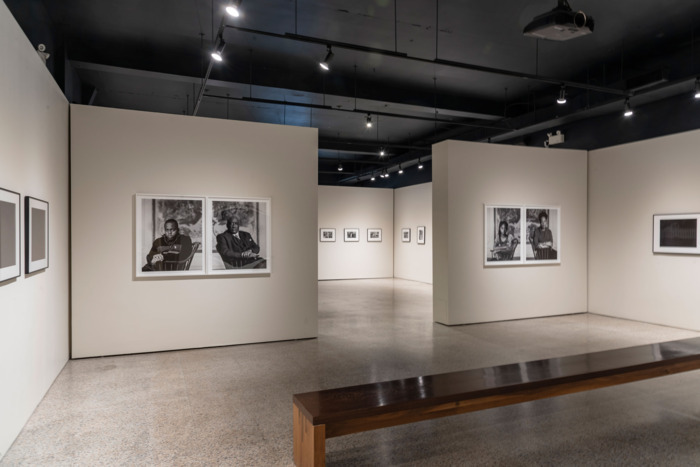 Portrait photographer Bey’s exhibition shows a range of staged and candid moments from everyday black life in America, selected from four different bodies of work spanning his career, from his earliest, breakout series “Harlem USA” to the more recent “Night Coming Tenderly, Black.” The striking thing about Bey’s work is the sense of intimacy. You feel a real encounter with his subjects.